Elizabeth Fleischmann, a science teacher at Notre Dame Preparatory School in Baltimore, gets in on the shad run in the Gunpowder. Shad have arrived on most, if not all, of their Chesapeake spawning grounds, including the James and Rappahannock in Virginia, the Potomac (Fletchers Cove), and in Maryland on the Susquehanna, Gunpowder and upper Choptank. These are strictly a catch-and-release fish, but man, what a hoot on fly or light tackle gear. 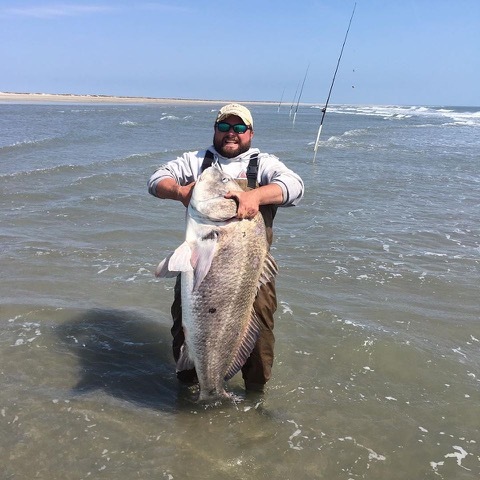 Another mark of spring’s arrival on the Chesapeake is catching black drum in the surf and shoals off Virginia, including a 71-plus pounder caught by Trey Jones, who checked in the big drum at Chris’ Bait & Tackle in Cape Charles. Last week, the Maryland Department of Natural Resources (DNR) announced that Maryland’s cobia season and restrictions would match Virginia’s rules with a season running from June 1 through September 30. The minimum size will be 40 inches, and the limit is one per-angler-per-day with a maximum per-day boat limit of three cobia. In Virginia, only one of the three may be over 50 inches long. Anglers fishing for cobia in Virginia waters must also obtain a no-cost cobia permit from the Virginia Marine Resources Commission or an authorized Virginia fishing license vendor. Anglers in Virginia waters must also report their landings within 21 days of the end of the season. Failure to do so will mean not being able to obtain a permit for the following season. Trey Jones caught this 71-plus pound black drum off the Virginia surf recently. Photo: Trey Jones & Chris’ Bait & Tackle/ Facebook. In the 21st Century data is king, and that’s certainly true in the wildlife and fishing worlds. The more biologists and managers know the better they can develop, plan and implement policies and strategies to better manage our natural resources. Which is why Maryland DNR is promoting its mobile-friendly Volunteer Angler Survey that asks anglers to use their smartphones to help track and record basic catch information such as species, location and size. Other programs, including the artificial reef initiative, blue crab, freshwater fisheries, muskie, shad and striped bass programs have also been upgraded to take advantage of mobile-friendly technology. The recent buzz around the citizen-science concept is encouraging, the fact is, people have been sharing information with wildlife and fishery agencies for decades. Those young, old or somewhere in between can participate in the Volunteer Angler Survey, and have a chance to win quarterly prizes. Check out DNR’s volunteer angler survey webpage for details.